A few weeks ago, we were in San Francisco and stopped at one of our favorite shops, Brendan Lai Supply Co. Brendan, sadly, has been gone for several years, but the shop continues to operate under the experienced and expert guidance of his wife, Esther, and son, Al. And a visit to the shop always involved several stories from Brendan, along with demonstrations of some new Chin Na that he had developed. So much has changed over the years in martial arts. Weapons back then that were so exotic you’d never hope to see one in your martial lifetime now flood the internet; of course, now they are cheaply fabricated, so many turned out to please a group more familiar with Chinese film than the actual feel of the heft of a quan. Our conversation with Al an d Mrs Lai, on this summer day, turned to what was still available. They bemoaned both the flood of cheap materials, which they will not sell, and the depletion of real weapon-makers in China and Hong Kong. Which brings me to the inspiration for this post: not to fall sway to memories of the good old times, but to comment on, of all things, the package of rattan staves sent by Al Lai a few days ago. When we were there, he told us that he had a nice batch coming in, and would send us some when they arrived. First, they are beautiful. Al still takes time with every weapon that comes through his door and makes it good before it leaves: sanding, extra gluing of handles, polishing, straightening. Whatever is needed to make the weapon right. And they buy from people they trust in general, to get good material to begin with. These feel like the staves from days past: smooth, good weight, full. In that alone we would have been pleased. But he went even further; take a look at the scattered pictures in this post and consider getting a package like this: first of all, Al split the pack of six plastic-wrapped staves into two rows of three, divided by a cardboard separator. Then he threaded pink plastic twine behind the cardboard, wrapped it at least eight times in six different spots down the length of the package.Then, each wrap was tied in with exactly the same slip knot we use to tie our Kung Fu belts. Unwrapping brought back memories of those Qing Wu uniforms that had to be laced up a loop at a time but could be popped open in a flash (presumably to answer a challenge). It brought back so-called Tai Chi shoes which originally had replaceable soles that eventually became plastic bottoms, an item that made all the sense in the world become an item that was virtu ally useless. It brought back hand-cupped spear heads, custom made weapons racks, school-produced training targets and equipment, Kung Fu boots with soles made from Goodyear tires, student-built safety equipment. It was a world that had not, in two thousand years, developed cookie cutter weapons to match cookie cutter performances. Folk arts, you know. The scary point is when people can no longer tell the difference. I don’t know if this bit of added attention will impress others, but I felt the need to shout out that there are still people in the martial arts with a fine eye and sense of quality; that despite the crassness of the commercial aspects, there is a shop in San Francisco�the last one remaining, by the way�that cares about the weapon that you might pick up and take outside to practice as the autumn day cools to evening. Posted September 28, 2013 by Debbie Shayne. Comments and trackbacks are open. Follow the comments feed. 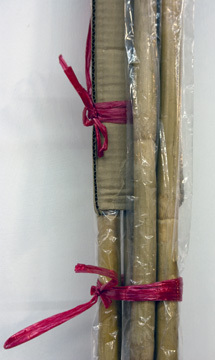 Tagged with: Brendan Lai, buy martial arts weapons, Dao, gun, Jian, Kung Fu Staff, kung fu staves, Kung Fu weapons, martial arts weapons, rattan staff, rattan staves, sabers, swords. What a nice post! Thanks for helping us who are new to the arts to get a sense of the legacy we are inheriting and the fine people who have kept the arts true, deep, and vibrant. We students learn to discern mainly because those senior to us take the time to teach us, to help us see and sense, to show us this rich inheritance. A beautifully written piece–thanks. I’ve always been meaning to make a day trip there! Thanks for the great recommendation. Just stopped by Brendan Lai Trading Co. It’s closed. A note on the door wishes everyone well and thanks for support over the years. I took a photo and will send along.